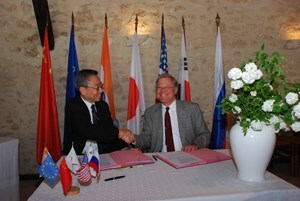 It's the Big One: Kaname Ikeda and Frank Briscoe signing the contract for the construction of the ITER buildings. 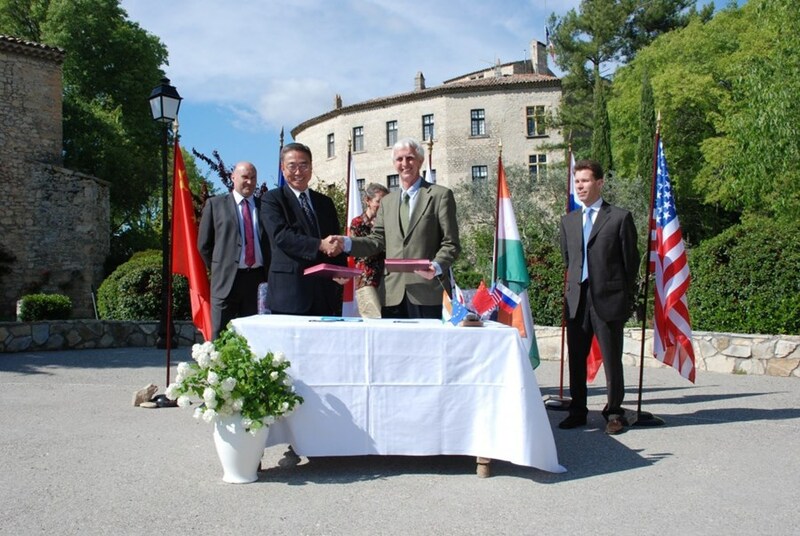 Excitement was in the air this Friday afternoon when tables adorned by flags representing the seven ITER Member states were carried into the courtyard of the Cadarache Château to prepare for the long-anticipated moment. "This is a big one," one spectator observed and indeed, the Procurement Arrangement which the ITER Director-General Kaname Ikeda and Frank Briscoe, the Director of the European Domestic Agency signed a few minutes later represents the largest procurement in ITER history. Worth more than EUR 537 million, it covers the construction of all the ITER buildings and infrastructure. "This is a very memorable moment," said Kaname Ikeda, emphazising that with this 43rd procurement signed the ITER Organization has now committed almost 60 percent of its total procurement value. Frank Briscoe on behalf of the European Domestic Agency thanked everyone involved in the preparation of the procurement. "Soon now we will see very visible signs out there that ITER is making progress." Ikeda san and Ned Sauthoff, Head of the US Project Office, signing the procurement for the electron cyclotron transmission line. In the course of this meeting week, taking advantage of having most of the people in charge gathered in Cadarache, five more procurements were signed. On Tuesday, Director-General Ikeda and the Director of the Chinese Domestic Agency, Jin-Pei Cheng, had signed three Procurement Arrangements all at one shot. These contracts, for a total value of more than EUR 47 million, cover the supply of 18 correction coils plus the support structure for ITER's magnet system and the cable-in-conduit conductors for the correction coils and the feeders. 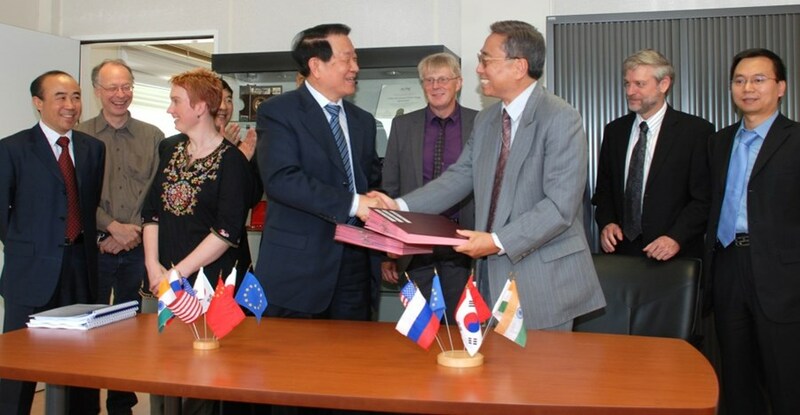 On Wednesday, a Procurement Arrangement for the pre-compression system for ITER's giant toroidal field coils was signed with Europe, and on Friday, it was time for Ned Sauthoff, Head of the US Project Office, to get his pen out and to sign the Procurement Arrangement for the transmission lines of ITER's electron cyclotron system. Kaname Ikeda and Jin-Pei Cheng shaking hands after the signature on Tuesday. Applause after a signing event is not uncommon, being a sign of relief and achievement. This afternoon, as the pens were put back into the pockets and the document folders closed, the clapping was a little more intense than usual. Even the sun that had disappeared behind dark clouds for most of the week decided to come out and smile as the champagne was served to a cheerful crowd.